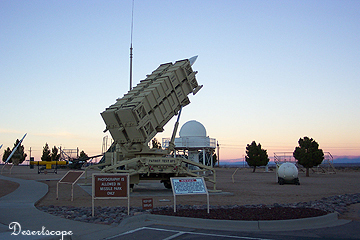 Directions: From Highway 70, take the White Sands Missile Range exit (between markers 169 and 170). Follow the Owen Road to the entrance of White Sands Missile Range. Visitors don't have military decals on their cars must stop here to sign in. 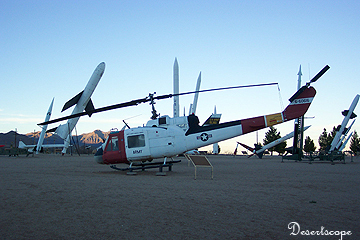 Once inside of WSMR, the Museum is located at the left side of the main gate. 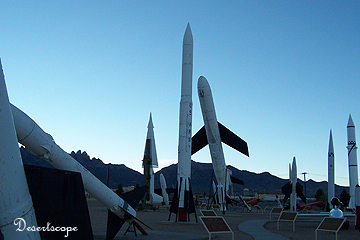 Although the entrance to White Sands Missile Range (WSMR) is restricted, the WSMR Museum is open to the public. The entrance to the museum is free and photographs are allowed on the Museum ground. The Museum is open year-round from 8:00am to 4:00pm on weekdays and from 10:00am to 3:00pm on weekends. It is closed on federal holidays. Outside of the Museum is the Missile Park. It contains more than 50 rockets and missiles on static display. These missiles and rockets are from all three services and ranging from the V2 Rocket to the newest Patriot. All of them had been tasted here at WSMR. Within the Museum is a small gift shop that sells books, souvenirs, jewels, t-shirts, hat, etc. Along the hall of fame, there were famous scientists and people that were once worked here at WSMR. Along many others was Dr. Wernher von Braun, one of the greatest rocket scientists in history. Inside the large room were pictures, artifacts, and instrumentations that constitute a rich history of WSMR. From the hunting and gathering Indian tribes that left numerous arrowheads, pottery and tools here at WSMR, to the pieces of hardware that were used in space shuttles.